Japan has indicated this week that it is preparing to recommence bilateral discussions with North Korea, ending a stalemate that has lasted nearly four years. 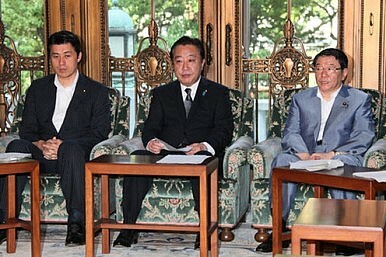 Chief Cabinet Secretary Osamu Fujimura told reporters that “there are several issues between Japan and North Korea and after having discussions we have decided to hold inter-governmental talks soon.” Osamu also indicated that Japan will work with North Korea “based on the principle of settling the unfortunate past and on restoring normal relations.” The talks will follow up a productive exchange between national representatives from the Red Cross in Beijing earlier this month on the potential return of the remains of Japanese soldiers from World War II. Japan severed most official diplomatic channels to North Korea after its failed missile test in April 2009 and its second nuclear test the following month. The stalled Six-Party talks on the North’s nuclear weapons program have also been suspended since these incidents. Earlier this year there had been some hope of a potential resumption of the nuclear talks after the Leap Year deal in which North Korea agreed to suspend its uranium enrichment activities and implement a moratorium on its long range missile and nuclear tests in exchange for the U.S. commitment to send 240,000 tons of food aid. This pact was scuttled by yet another failed missile test this past spring. Relations between Japan and North Korea have been tense for decades. Japan continues to insist that Pyongyang should be honest and cooperative on resolving the issue of the abduction of Japanese citizens. Tokyo also condemns the North for its belligerence with regard to missile tests over its territory and Pyongyang’s nuclear weapons program. As a result, Tokyo has also maintained a tough set of unilateral sanctions to complement the existing UN Security Council penalties on Pyongyang that have been in place since the North’s first nuclear test in 2006. These sanctions, which were renewed earlier this year, have effectively cut off all bilateral trade between the countries. North Korea also has issues with Japan lingering from its colonization of the Korean peninsula before and during World War II. Tokyo continues to be a dart board for the North’s hardliners and is accused of being a mere outpost of Washington. The North also takes a hard stance against Japan’s territorial claim to the Dokdo islets (Takeshima to the Japanese) and recently insisted that the issue was “directly related to (Korean) national dignity” and that there could be “no concession or compromise” with Tokyo. While vehemently anti-Japanese on Dokdo, Pyongyang wasted little time in dismissing South Korean President Lee Myung-bak’s trip to the Islands as “intended to cover up his true colors as a pro-Japanese lackey”. It is always difficult to get a handle on the strategic calculus of the opaque leadership decisions in North Korea. However, this may be a sign that there is a more evident two-track approach from Pyongyang towards reengaging with one of its biggest rivals in Northeast Asia. The prospect of a thaw in the Japan-North Korea relationship appeared increasingly bleak over the past couple years as the North continued it belligerent missile tests and aggressive actions against South Korea. Pyongyang has also been actively working towards isolating Japan from returning to the table at the Six-Party talks. There has also been internal pressure for Japan to respond to the North’s intransigence with more urgency and hard power. With these enormous caveats and a complex historical relationship, nothing is guaranteed as an outcome and expectations for an imminent détente should be tempered. Despite this, the recommencement of talks between Japan and North Korea is a step in the right direction and could have spillover effects on Pyongyang’s engagement with South Korea and the U.S.
A DPRK statement that a “spark” could set off nuclear war on the Korean peninsula is again raising questions. The Significance of Russia’s Frustration with North KoreaThe North Korea ProblemA Change in North Korea's U.S. Policy? Can North Korea Have Soft Landing?Can North Korea Come in From Cold?